At any rate, the hamburgers were absolutely delicious. We served them with my favorite tzatziki potato salad, adapted from this recipe. 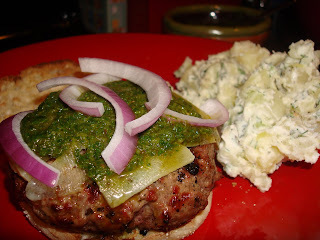 Bobby Flay's chimichurri, used as a garnish for these burgers, is one I'll make from here on out. It's delicious on any kind of grilled meat. He makes it with cilantro sometimes, too, depending on the dish. But this traditional version knocked my socks off. Combine parsley, oregano and garlic in a food processor and pulse until coarsely chopped. Add the paprika, vinegar, and oil. Season with salt and pepper and process until smooth (just a couple of minutes). Scrape into a bowl and let sit at room temperature for 30 minutes before serving. The sauce can be made 8 hours in advance, tightly covered and refrigerated until 30 minutes before serving. i love booby flay even with his moobs! !